From whimsical kite displays on the beach to Japan’s largest fireworks display, the most exciting festivals, exhibitions and events are all within reach of your Conrad address. What: Showcasing the very best in international and British craftsmanship, with venues across the city hosting workshops from little-known makers to highly acclaimed masters. Why: An all-encompassing, immersive cultural experience where visitors can meet artists and peek behind the doors of venues not normally open to the public. Distance from Conrad London St. James: Various locations are within 10 minutes’ walk. Where: Taito Riverside Sports Center, Tokyo. What: With nearly a million people descending to the banks of the Sumidagawa River, this competition between rival firework manufacturers offers visitors a truly dazzling display of 20,000 fireworks lighting up the sky. Why: Originating in the 1700s, this annual event is steeped in tradition and infused with a healthy dose of competition. Distance from Conrad Tokyo: 20—30 minutes by car. Where: Padang Galak Beach, Sanur. What: This annual festival offers visitors a chance to turn their sights skyward and enjoy a unique celebration of kite-flying. Timing is of the essence, as July and August mark the start of Bali’s windy season. Why: Legend has it that the festival started life as a spectacle to thank the gods for a plentiful harvest. 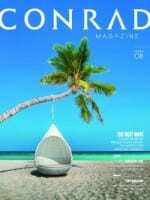 Distance from Conrad Bali: 30—40 minutes by car. Where: Cartagena de Indias Convention Center, Cartagena. What: Bringing together the best exponents of the nautical industry in Latin America, the Feria Internacional Colombia Náutica has firmly put Colombia on the map as a thriving boating destination. Why: With the largest selection of boats and marine accessories in the region, featuring brands such as Ferretti, Princess and Bavaria, you don’t want to miss the boat on this showcase. Distance from Conrad Cartagena: 30 minutes by car.